Two Indian Premier League (IPL) teams with two striking similarities — empty trophy cabinet, and new captains — were hoping for a good start to IPL 2018. Only one of them managed to achieve it. Kings XI Punjab (KXIP) faced Delhi Daredevils (DD) at their home turf in Mohali. Former captain of Kolkata Knight Riders Gautam Gambhir was taken by DD this year in IPL 2018 auctions. KXIP, too, had a new captain in Ravichandran Ashwin. KXIP won the toss and invited Delhi Daredevils to bat, and thus began a series of mistakes and errors for DD. Hopes were pinned on the newly appointed captain Gautam Gambhir. And he did not disappoint personally — he struck a half-century. But he did not get the required support from other batsmen. Opener Colin Munro, dismissed cheaply for 4, became the first wicket for the youngest debutant Mujeeb Ur Rahman. Punjab’s bowling was not as menacing as one would have thought. Indeed it was the poor shot selection of DD batsmen, and their lack of character, that made the scorecard look so modest. A few cameos did not prove very helpful, either. Rishab Pant went hammers and tongs to score a quickfire 28. But when he needed to show some maturity, he failed and threw his wicket away. 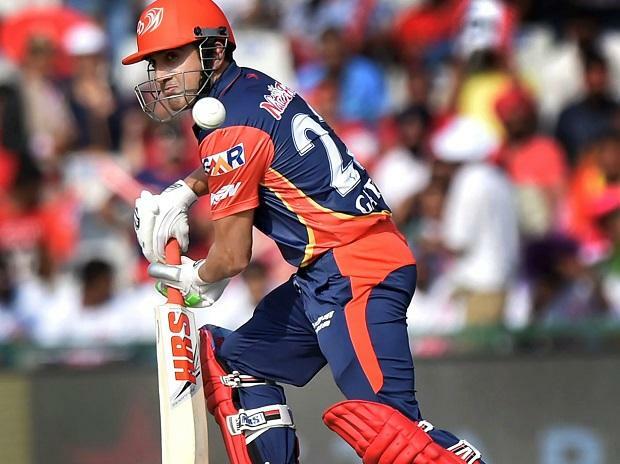 Gambhir did all he could, but eventually gave in to the pressure of increasing the run rate and was dismissed for a decent 55 off 42 balls. What really hurt the innings was the inexperience of his teammates. His own dismissal was not ordinary; he got run out and the players that followed him could not do much. Chris Morris made a quick 27 to take the team to a respectable-but-still-difficult-to-defend total of 166-7. One would think chasing 167 would be easy, but the first match of this IPL season — between Chennai Super Kings and Mumbai Indians — proved otherwise with a similar scorecard. Frankly, that was the expectation from the bowlers of Delhi — to at least put up a flight and turn this one into a close encounter. But, alas, DD bowlers were destined to take the field only to be smashed! It was opener K L Rahul’s date with destiny. From ball one, he made his intentions clear. He smashed, he hammered, and he ripped apart Delhi’s bowling. The bowlers had no answer whatsoever to his tactics. If you earlier thought DD’s batsmen were the champions of displaying immaturity on the field, now you had Delhi’s bowlers proving they were not far behind. Rahul hit towering sixes and ferocious boundaries all over. So much so that he went on to score the fastest ever IPL half-century, taking only 14 balls to achieve the feat, with 6 fours and four sixes. Star bowlers of Delhi — Trent Boult, Mohd Shami, and Amit Mishra — were hammered. The worst part was that these players had more experience than Rahul and yet they could do nothing to contain him, or Karun Nair, who too scored a fifty. Disappointing line and length, no variation, and lack of creativity were some of the reason for abysmal bowling. And, eventually, Delhi lost by six wickets. If you could not fault the batsman Gambhir, the same could not be said about the captain Gambhir. Overall, the captaincy was sub-par, but then there was not much he could do to save his team from a shameful defeat. Yes, it was Rahul’s day. Such performances happen once in a long time (like ABD’s 31-ball century against West Indies in an ODI), but not being able to control the flow of runs is something Delhi needs to ponder about. Delhi gifted this one to Punjab on a platter by failing to score runs and then not even trying to defend the total. This is what you a call a team’s collective failure. Batsmen do not put up a good score. The captain fails to bring in his experience to improvise and contain the other side. The bowlers do not even try. The game never belonged to Delhi. It had Punjab written all over it.